VERSE features a proprietary composite driver diaphragm specifically engineered to ensure authoritative bass performance that smoothly transitions up through the clearest of midrange regions and on to highs of amazing crystalline clarity and transparency. The graphene we used in our driver enabled the development of a thin and flexible driver that can reproduce stronger, richer, and more accurate sound without extra weight or distortion. VERSE is IPX5 water and sweat proof. You can now enjoy your favorite music while doing daily activities to strenuous exercise. 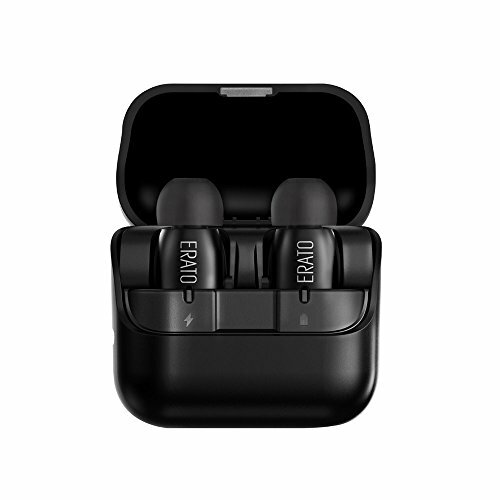 VERSE earbud weighs just 4.5g each and embeds a MEMS microphone to reduce power consumption, increase sensitivity, and improve noise reduction. With included charging case which can holds up to 4 recharges, VERSE can last up to 15-hour on the go. ERATO VERSE comes with one year warranty. *To ensure maximum musical experience, please update your paired devices to the latest software version. For detail on the pairing procedure, please refer to the included start guide. **For maximum musical experience, please choose the eartip that fits your canal. SpinFitTM tips - Patented SpinFitTM tips allows users to choose eartip size that swivels to help make a complete seal in your ear for maximum response. Single Touch Multifunction - With a single button you can power on/off, take a call, play music, skip tracks, change volume or even access Siri easily by tapping, holding, or double-tapping on the button. If you have any questions about this product by ERATO, contact us by completing and submitting the form below. If you are looking for a specif part number, please include it with your message.